News that the people of Iceland had voted 'No' in the referendum asking if they should pay back money to investors has been met by clamours from millions of British children who want to move to the mid-Atlantic island. The demand from British children to move to Iceland came after the Icelandic government, led by the sloped-shouldered Prime Minister Jóhanna Sigurðardóttir, decided not to fulfil their international commitments. Since people might shout at them they decided to pass the buck onto the people who pay them to make such decisions on their behalf. The leader of the ruling Teflon Party said that it had considered all available options in terms of fulfilling its international obligations but the sums were very hard indeed. Instead they asked all of the other Icelandic children over 18 to vote on whether they would like to do something unpleasant or not. The UK treasury said that it was going to pursue every avenue possible to reclaim the €4bn that it felt it was owed. What do you expect from a country named after a downmarket supermarket chain? Nothing wrong with Iceland! 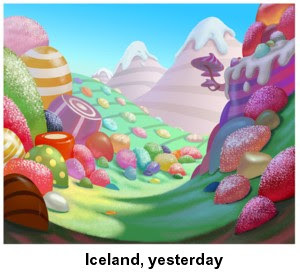 That's why mums go to Iceland. Just pay my fee intothe bank directly. But obviously not one of those poo covered Icelandic ones.